Join Donna at an upcoming Community Conversation! Stop by to meet Middlesex District Attorney candidate Donna Patalano at Remnant brewing for an evening of conversation and craft beer, hosted by Indivisible Somerville. Join us for a DA Forum hosted by the Framingham League of Women voters on Monday, August 20th at the Costin Library, 48 Lexington Street Framingham. The event will begin at 7:00pm, and Donna will be sharing her bright vision to bring new outcomes and a social justice perspective to the Middlesex DA's office. Join us in Wayland to eat, relax, and learn more about Donna's vision for meaningful change at the Middlesex DA's office! Saturday, August 18th. The theme of this year’s breakfast is “Overcoming Barriers: social, economic, and educational barriers—impediments to gaining equal assets.” Middlesex County District Attorney candidate Donna Patalano will serve as Keynote speaker. Reserve a seat at our breakfast by mailing a check for $50 per person to MVA NAACP, P.O. Box 132, Medford, MA 02156 or by contacting Ed Ligon at (617)-680-4571 or Pearl Morrison at (617)-803-3549. Join us for a cocktail hour with criminal defense attorneys from across Middlesex County with special guest Donna Patalano, candidate for Middlesex District Attorney. "On August 9, 2018, come enjoy food, entertainment, and conversation with fellow Malden Democrats and friends in a relaxed and informal cookout atmosphere. This popular event provides a unique way for you and your family to meet and hear from officials, candidates, and Democratic activists in Malden and vicinity and learn more about how you can get involved." Donna will be speaking to the community about her vision for meaningful criminal justice reform in the Middlesex County DA's office. This is the Natick Dem's number one social event of the year. Meet fellow Democrats, including both local and state-level leaders. Since this is an election year, we’ll undoubtedly have a number of candidates on hand. Dress is casual, and we’ll have plenty of food and beverages. The event takes place in the backyard of longtime hosts Jay and Erica Ball, 11 Russell Circle in Natick. 5:30-9:30 pm. Stop by for a Meet and Greet at the home of Mary Howard in Cambridge to meet District Attorney Candidate Donna Patalano and to learn about what steps she will take on day 1 to help end mass incarceration and bring greater transparency and equity to our criminal legal system. Come to the Reading Wingate Senior Center to meet Donna and speak with her about her progressive message of safety and social justice! Join us in Arlington for a Summer Party at the home of Martha Gray and Julius Pereli to hear Donna speak about her vision to fight for government transparency, to improve outcomes for young people, and to champion the rights of victims. 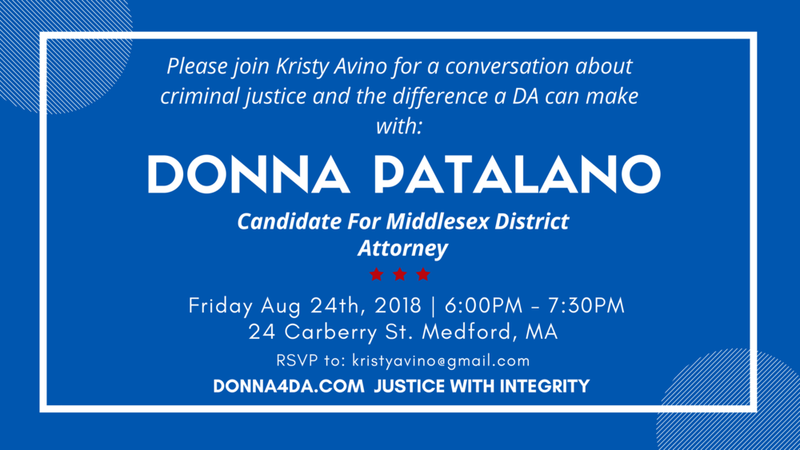 Come to meet Donna Patalano in Dracut on Thursday, August 2nd, to hear more about her plan to bring meaningful conviction integrity, juvenile justice policy, and immigration protections to the Middlesex District Attorney's office. Join our hosts Sophan Smith and Bobby Tugbiyele for this opportunity to meet with Donna and ask questions about her vision for reform. Join our Hosts Ed & Linda Englander, and Allison Sharma for a Meet and Greet in Auburndale. Donna will speak about her plan to improve outcomes for emerging adults and juveniles, reforming our bail system, and using innovative solutions to tackle the opioid crisis. Join our hosts Diane Sherlock & Al Lewis for a Meet and Greet at Dumpling Daughter in Weston. Donna will speak about her progressive vision to bring accountability, transparency, and meaningful reform to the Middlesex District Attorney’s office. Donna will attend a meet & greet for Democratic primary candidates on Saturday, July 28th at the home of Jaya & Ram Voruganti In Burlington. Co-hosts include Burlington DTC Chair Chris Campbell, Rosalynn Minassian, Phyllis Newfeld and Larry Cohen. Stop by our table in the First Amendment area of the Lowell Folk Festival to learn more about Donna's vision for meaningful change at the Middlesex DA's office. We will be there from 10:45am until 6:15pm each day of the festival to chat with folks from Lowell! Information about Donna will be available in Spanish, Mandarin, Portuguese, and Khmer. Stop on by to hear about why we need urgent change in our criminal justice system, and why Donna is the right choice to fight for criminal justice reform on September 4th. Transit: Parking (50 cents) on the street and in municipal lots on the other side of Massachusetts Avenue. Bus lines from Alewife, Davis, Harvard, Lechmere, and Porter stations. Stop by the Remnant Brewery in Somerville for a conversation with Donna and progressive folks from Cambridge and Somerville.